It’s all about color in Kathmandu. No matter how dingy, dusty, crowded or garbage-strewn the land, people dress in extraordinary combinations of colors. You can tell the tourist by his dull khaki, hikers green and faded blue jeans (which women do not wear here.) But whether Buddhist, Hindu or just a local, the Nepali fashion soars in bright color upon bright color, especially the women and the monks. Men wear brightly colored Nehru type caps and some wear the Nehru white vestments. But few teens and children wear message t-shirts, sports jerseys, short skirts, although young monks are prone to the latest Nikes under their red robes. Even Kathmandu apartments, four stories high, thin and wide in structure, shaped windows filling the entire front of the house, wrapped in balconies for each floor are artistically painted. Yet living quarters might lift them from the stench of the streets, but there are no gardens that I can see, rather on the side or in front cling small lots filled with garbage. There are garbage pickups, but not regularly, because of the election and not at all in some difficult sectors (barrio, hood.) Streets are so narrow and congested there’s a conflict when two vans going in opposite directions must pass. There are no sidewalks or clean streets or useable water or order to anything. Yet, Kathmandu emits friendliness and curious chaos along the streets filled with children on a school spring break, geared toward the elections and two holidays coming up this weekend. My first real day in Kathmandu began trying to find out what the blue marvels of University of Memphis basketball were doing, but it’s 12 hours on the next day here. I ate breakfast while the final game was being fought. Breakfast was sweet papaya slices and a crisp large thin pancake made from pureed beans and grain filled with a curried potato and herb salad and served with spicy cucumber sauce. The Indian curry influence is major in food preparation here. My guide today for a trip to three religious centers was a brilliant elderly man, Krishna. On tap was the Monkey Temple - Swayambhunath, the oldest Buddhist temple of Nepal, built 2000 years ago; Kopan Monastery which is a mastery of peace and cleanliness; and the Tantra Art School. There are Buddhist temples and Buddhist monasteries. Monasteries can be set up by an elevated monk who has reached the title of "Impoche" or high teacher. He finds a place, paints the dome or pinnacle with a gold and there sets up his monastery, which seems to me so similar to pastors who feel they’ve been called by God as teachers and preachers and set up their own churches. Impoches are highly respected and draw students because they are good "preachers" as well as walk with a certain kind of aura or peace. 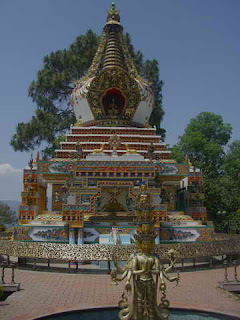 Most Buddhist temples are ornate and colorful structures with a center tower-like temple offering seat s for the five Buddha statues and a stairway high above circling symbolic of the soul’s tread toward the fully enlightened (holy) state, until it reach the lotus at the top, which is the seat of God. The point is to live life like a lotus - detached and free. Need as little as possible. Dying frees one from detachment and this is the idea behind nirvana. Enlightenment is the pathway we walk to stop grasping and to let go. Nothing is fixed, not even the universe, and all is cause and effect. In other words, one aims to lose all desire and greed and material style so he might be purified by negation of what is around him but at the same time become part of it free of stress, races for achievement or acquisition and deep breath into being at peace and in the moment. Seek this one release into karma which governs what happens to you in the next life as you walk the road to that lotus top. At least that is my interpretation. Pardon me if I’m wrong. My favorite part was the wall around temple sites which one must walk clockwise to hear the ringing of a bell when thousands of prayers are accepted. 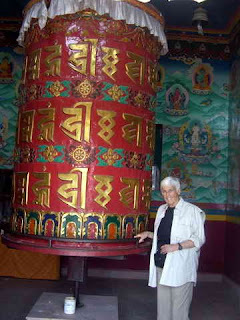 White walls are lined with metal prayer wheels, which those in prayer walk touching each of the wheels to make them swirl, stopping in sort of chapel like areas to walk around a giant prayer wheel, and continuing on until the mission has been completed. True Buddhists do this twice a day, carrying prayer beads or rosaries in their left hand, resting on the lower hip, in early morning and after tea. Offerings are made in order to receive a blessing from a lama, who is usually sitting in one of the cut out altars dispensing marigolds as a blessing, or a red spot on a forehead. Of course, in gratitude, you make a financial offering, however small, or throw sunflower seeds or flower petals to the statue of Buddha in the cubbyhole. I turned the wheels praying not the Oh Nam of Buddhism, but for God to save the children of Memphis. Swayambhunath means self-created, and historically, Buddhist believe this te mple was created on its own, by itself, out of a lake no longer present. No one knows how it got there, much like the mysteries of Zimbabwe in Africa and the massive Easter Island figures. At the Monkey Temple at the top of a tall hill, a visitor is surrounded by prayer flags blowing in the wind, old ones, new ones, always the five colors (red, green, blue, yellow and white) which represent the five images of Buddha. 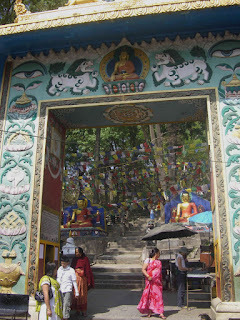 In the temple structure there are statues of Buddha in symbolic positions and colors. White is the color of the center, Buddha, the most important of the images; red for power is the color of the west Buddha, blue is that of the east, yellow is that of the south, green is that of the north. These statues sit in the familiar yoga posture but with their hands in certain positions: The right hand raised is go offer protection or blessing; the right hand open but turned downward touching the ground represents the witness to enlightenment; the hand open, which represents the south is a hand of giving; and the palms up position one cupped into the other of the western Buddha is a sign of meditation. The Center Buddha shows one hand linked to the other by making circles with the thumb and forefinger. It means I give, you take. It’s knowledge from the ideal teacher. There are also five kinds of wisdom, and many other symbols of the Buddha figures which I’ll spare you my description. This very complex temple series of structures and gates and walls of prayer wheels is a true pilgrimage destination. But don’t look the monkey in the eye as he might attach to you, grab anything hanging from you, and you don’t want that. I wore my sunglasses. Most moving to me was visiting a remote monastery where monks live, study and worship. The temple there is hung with elaborate fabrics and laid out are offerings t he monks sculpt from yak butter, some into colorful flowers. Color, color, color, embroidered textures, shiny silken thread, and religious artwork that comes alive, this is the experience. Monks are a true Buddhists gift of the family’s second son. They might begin duty as early as age four. They wear the dark red robes all through their teens, usually with flip-flops, and when they reach a certain age, after so many years in the monastery’s protection and training, they may choose to return to normal life rather than continue training to become an Impuche, or teacher. Girls have their monasteries too, but their choice to take up the life of a nun is made by their families. And girls do return to normal life at a certain age. There is a Mother Buddha, Harati, who is constantly surrounded by children and has a special gold-decorated temple at the Monkey temple area. At the final stop, another temple in a compound of many monasteries, was a T anka School of Art where students and some selected monks spend their days copying religious mandalas and paintings. It’s based on the same idea of icon painters. There are certain formulas to be copied and paint is crushed from rock, rather than pigment. The amount of gold in the painting on a te diously prepared canvas, determines the value of the piece. The current Dalai Lama even created his own mandala a few years ago which is the first abstract mandala, sort of a bird’s eye view of the temple complex leading to the highest Enlightenment or God. Imagine flying over an ancient pyramid and looking straight down. You get the view that occupies a large square format. This has also been reproduced by him as sand art, another monk skill, sand being the ground up grains from rocks of different colors. 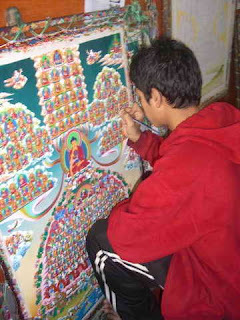 I spoke with one 22 year old monk named Karma Lama, an auspicious name which he was given when he entered the monastery. His work is impeccable. I asked if he ever does creative art, and he said yes. He likes abstract art. Of course he is the one who reproduces the Dalai Lama’s mandala to be sold to collectors and receives no pittance of funds, which he doesn’t need. The whole day had stirred my soul as I learned to delight in a religious art form which I had always ignored and considered gaudy and too complicated. And it has certainly made me rethink the American obsession for possessions. 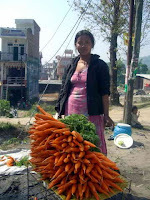 Photos: The Carrot Lady (It's carrot season. ); Ground entrance to the Monkey Temple; Temple with 108 Buddhas at a Monastery; Pushing a giant prayer wheel; monks in training; colorful decor in the temple of a monastery; a religious artist painting a tantra.